Friends of Te Papa $10.00, General Public $15.00. Edwina Ehrman is a Curator of Textiles and Fashion at the V&A. She is the curator of the touring exhibition, Unveiled: 200 years of wedding dress from the Victoria and Albert Museum, London, which will open at Te Papa on 17 December 2011, and the author of the associated publication, The Wedding Dress: 300 Years of Bridal Fashions. She is a specialist in nineteenth-century textiles and fashion, with a particular interest in London. 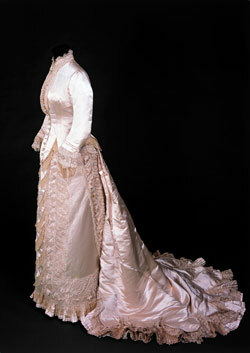 In her talk at Te Papa Edwina Ehrman will give a behind-the-scenes insight into developing the V&A’s wedding dress exhibition. She will describe how she selected the wedding dresses for the exhibition, the insights she gained when researching the associated book and the process of dressing the mannequins and preparing them for their long journey to the other side of the world. The presentation will include images of many of the dresses and accessories that visitors can look forward to seeing in the forthcoming exhibition. Following the lecture there will be an opportunity to purchase Edwina’s book and have her sign it. Phone the Friends office (04) 381 7051 for credit card bookings. Join in person at the Information Desk, Level 2 in Te Papa. This entry was posted in Local events, Wellington and tagged Edwina Ehrman, Te Papa, Unveiled: 200 Years of Wedding Dress, Wedding dress. Bookmark the permalink.